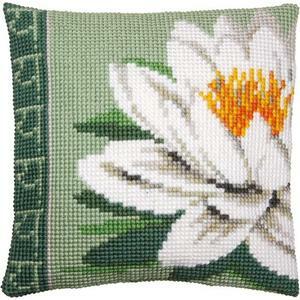 The kit contains hand painted canvas for easy stitching, needle and acrylic yarn. All of the Vervaco cushion front kits have the design very carefully handpainted onto the canvas itself. There is no paper pattern to follow. This technique is proving very popular as it means you can concentrate your sight onto the canvas and do not have to keep adjusting your vision away from your project. •These kits are worked in cross stitch using thick yarns •Completed item is 40x40cm •4.5 holes per inch count •A beautiful item to enjoy making. Vervaco cushion backers are readily available for these kits.